During a recent visit to Spain, German Chancellor Angela Merkel and Spanish Prime Minister Pedro Sanchez (who heads a leftwing minority government) agreed to start a dialogue with Morocco to assist with migrant inflows to Spain, which have increased ever since the populist Italian government started turning back ships coming from Libya and the Balkans route closed after Hungary and other nations put fences in place. Related coverage: <a href="https://thegoldwater.com/news/34547-Spain-Police-Shoot-Allahu-Akbar-Knifeman-After-Terrorist-Strike-Anniversary">Spain - police shoot ‘Allahu Akbar’ knifeman after terrorist strike anniversary (Video)</a>. As we reported, the routes from Africa to Europe have now all been closed bar one: the route from Morocco to Spain. It has since seen a grave increase in border crossings for a few months and as of late with ever more violent action against the police trying to stop them. 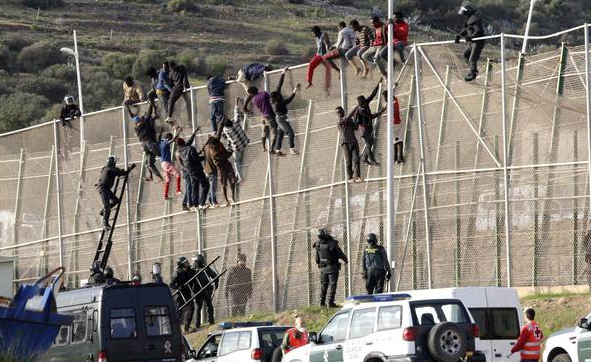 Yesterday, as a group of 100 African migrants forced their way into the Spanish enclave of Ceuta from Morocco, seven Spanish policemen suffered burns caused by a corrosive substance thrown by the migrants. Five migrants were injured in the jump, with bloodied arms and legs apparently caused by razor wire at the top of the fences. Most of them were young men shouting, "I love Spain!" as they walked to a temporary reception center. Related coverage: <a href="https://thegoldwater.com/news/33016-Spain-Illegal-Immigrant-Arrivals-Reach-Worrying-Levels-Video">Spain - illegal immigrant arrivals reach worrying levels (Video)</a>. Nearly 4,000 migrants have so far crossed the Moroccan border into the Spanish enclaves this year, according to the UN refugee agency. EU leaders have failed to agree on a long-term plan on where to house migrants since brokering a convoluted deal in June. Seeing the public anger over the violent actions of the migrants, the Spanish government decided today to refuse them asylum into Europe. What a great way to show your gracious host appreciation but to throw acid in their face. Machine gun turrets and let the bodies pile up as a deterrent to the next wave of parasitic heathens that try to force entry. If I needed a new country I would do everything possible to be acceptable and hopefully wanted by the potential new country. Screw this low IQ, violent, criminal racist scum. They should take them n Israel where they belong. If they hate white people so much, why do they follow them everywhere they go?